CBO estimates the shutdown cost $11 billion, and $3 billion won't be recovered. For the fourth quarter of 2018, the CBO estimated real gross domestic product was reduced by $3 billion compared to what it would have been. The level of real GDP for the first quarter of 2019 is estimated to be $8 billion lower, due to a combination of the partial government shutdown delaying approximately $18 billion in federal spending, suspending services for federal workers and a reduction in demand lowering output in the private sector. "Risks to the economy were becoming increasingly significant as the shutdown continued," the report read. "Although their precise effects on economic output are uncertain, the negative effects of such factors would have become increasingly important if the partial shutdown had extended beyond five weeks." 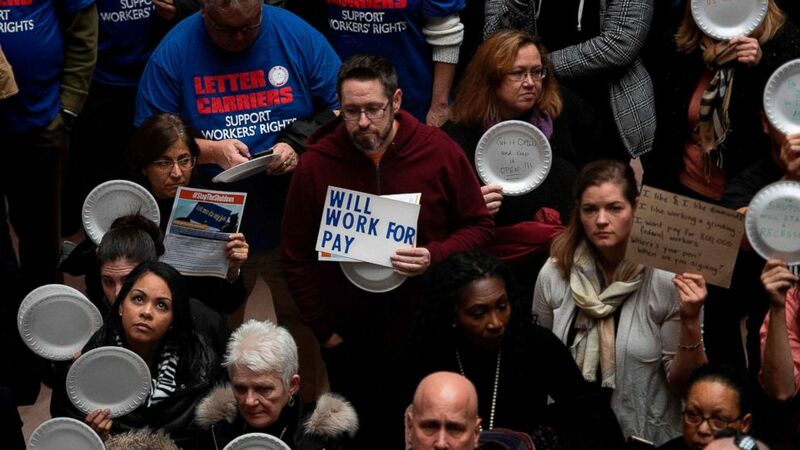 (Jim Watson/AFP/Getty Images, FILE) A federal worker stands with a placard reading "Will Work For Pay" as other federal employees stage a rally to call for a vote on the shutdown on Capitol Hill in Washington, Jan. 23, 2019. While CBO anticipates a majority of the lost real GDP will be recovered, about $3 billion will not be. That's about 0.02 percent of the projected annual GDP in 2019, according to the report. "As the dust settles from the Trump Shutdown, it is clear as day that the president's temper tantrum caused serious and lasting damage to our nation's economy," Schumer said in a statement. "If President Trump didn't appreciate the error of his ways after seeing the human suffering his needless shutdown caused, maybe the extensive economic damage he inflicted will set the president straight: No more Trump Shutdowns." House Speaker Nancy Pelosi said Trump should "swiftly sign" legislation to prevent another shutdown. "The President's shutdown inflicted needless pain and chaos in the lives of millions of Americans and stole billions of dollars from the economy. Workers' financial security, families' well-being and America's economic strength all were senselessly sacrificed because of President Trump's callousness," Pelosi said in a statement. "Families across the nation are still trying to recover from a month of missing paychecks and overdue bills, but the President is already threatening a second shutdown if he doesn't get his way." In the first on-camera White House press briefing in 41 days, Larry Kudlow, director of the National Economic Council, disputed the CBO's report, saying the economy is "very strong" and that "there's certainly no permanent damage to the economy." "In a $20 trillion economy, it's awfully hard to make even the best guesstimates of those kinds of small fractions of numbers. That's what you're looking at here. Let's see how it rolls out," Kudlow said. When pressed what effects another government shutdown may have on the economy, Kudlow said he did not want to speculate. CBO's report analyzing the shutdown's effects came just days after the financial rating agency Standard & Poor's analyzed the cost of the partial government shutdown on the economy and found it added up to at least $6 billion -- more expensive than the $5.7 billion Trump wanted for the border wall. About 800,000 federal workers were furloughed or required to work without pay during the historic shutdown. On Friday, Trump signed legislation to reopen the government for three weeks, until Feb. 15. "The weekly compensation costs for workers at agencies that were without an appropriation totaled roughly $1.8 billion, or about 40 percent of total compensation for federal workers," the report said. Trump said federal employees, who were on track to miss their second paycheck Friday, would receive back pay "very quickly, or as soon as possible. It'll happen fast." 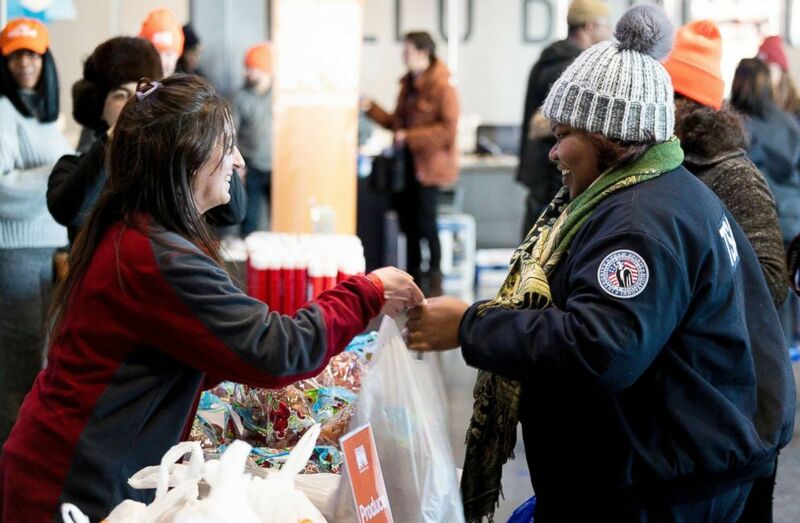 (Justin Lane/EPA via Shutterstock) Amelia Williams, right, a furloughed employee of the TSA, collects goods at a food donation site set up for federal workers by the Food Bank of NYC at the Barclays Center in Brooklyn, New York, Jan. 22, 2019. "...As a result of some reduced activities by the Internal Revenue Service (IRS) that are meant to ensure taxpayers' compliance with tax law, CBO estimates that tax revenues will be roughly $2 billion lower in fiscal year 2019 because of the shutdown," the report said. The CBO said uncertainty surrounded its report, particularly regarding the shutdown’s effects on federal compensation, due -- in part -- to the fact that the number of furloughed federal workers fluctuated over the course of the shutdown. If the shutdown had stretched longer than five weeks, it may have further diminished consumer spending because of interruptions to federal assistance programs, like the Supplemental Nutrition Assistance Program, known as SNAP, the report said. Food stamp recipients received full benefits for February amid the shutdown. 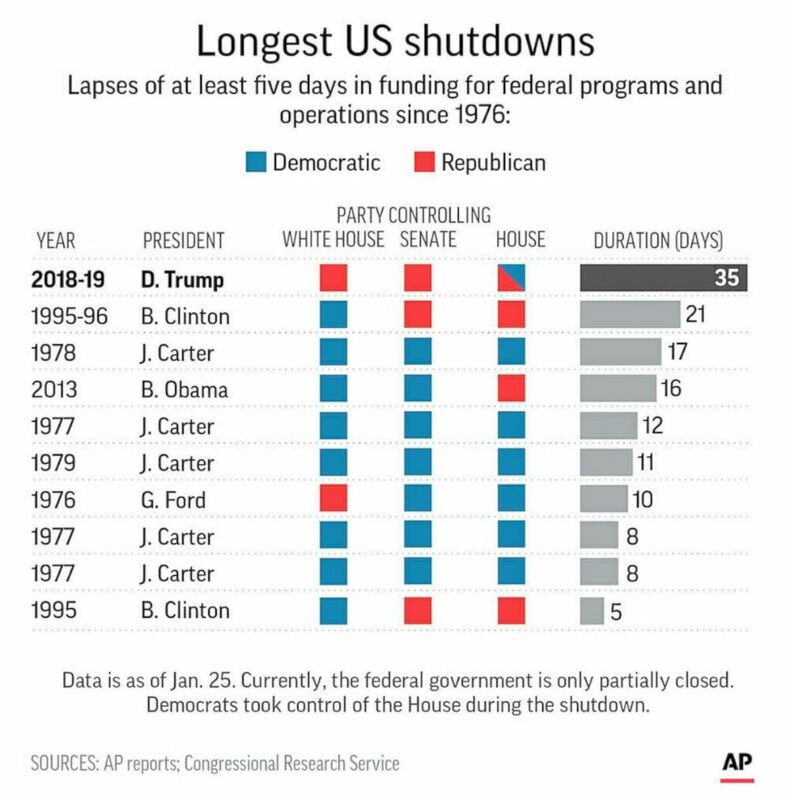 "Although CBO did not observe a significant drop-off in grants, subsidies, or other payments made to individuals during the five-week shutdown, a longer shutdown would probably have disrupted those payments," the report said.